Galliker’s milk is packed with nine essential nutrients – including calcium, potassium, and magnesium – that provide nutritional balance for you and your family. 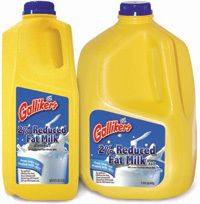 Cool, creamy, and with nothing artificial, Galliker’s milk is a nutritional powerhouse. In the Dietary Guidelines for Americans, milk is one of the “food groups to encourage.” Three glasses of low-fat or fat-free milk per day are recommended as part of a healthy diet. In fact, it takes eight glasses of almond "milk" to get the same amount of protein as just one glass of milk. Also, studies have shown that drinking milk can lower the risk of breast cancer. * In fact, research has found that women who drank milk as a child and still continue to drink three glasses a day had half the rate of breast cancer... half! While the race for a cure is still on, the road to prevention may be as quick as a trip to the fridge. At Galliker’s, we’re dedicated to bringing you the freshest and most nutritious dairy products possible. That’s why our milk comes in yellow jugs, which block light rays that can destroy nutrients like Vitamin A. Your family deserves the best, and that’s why we make certain there’s goodness in everything we do. * National Cancer Institute funded study of 48,000 premenopausal women, ages 34 – 39. Published in the International Cancer Journal. With the same essential nutrients, chocolate milk is just as healthy as white milk – and kids absolutely love the taste! Nonfat chocolate milk is the most popular milk choice in schools by a margin of 70 percent. By drinking Galliker’s nonfat chocolate milk, children get their three recommended daily servings of milk and enjoy every creamy, chocolaty moment! Numerous studies confirm that children who drink chocolate milk meet more of their nutrient needs; do not consume excess sugar, fat or calories; and are not heavier than non-milk drinkers. Chocolate milk contributes less than 2 percent of the total added sugar to the average child’s diet, whereas sodas and fruit drinks account for 50 percent or more. So children who drink chocolate milk increase their intake of nutrients without increasing added sugars and total fat. In fact, chocolate milk is more nutritious than sports refuel drinks as a post-exercise beverage. With protein, calcium and vitamin D, chocolate milk helps repair muscle and prevent stress fractures and broken bones. As children move into adolescence, their milk intake decreases and their soft drink consumption doubles. Chocolate milk helps to ensure that teens continue to get the nutrients they need for healthy growth. But Galliker’s doesn’t stop with chocolate. We enhance our refreshing, healthy and delicious milk with a tasty variety of flavors, including vanilla and strawberry! Galliker’s flavored milk is good for children, great for moms! When it comes to staying in shape, milk is a clear winner. Studies suggest that drinking milk can help maintain a healthy weight. The protein in milk also helps build muscle. Add exercise and a balanced diet, and you’re on your way to great physical fitness. Good taste meets great health. Milk is packed full of nine essential nutrients that your body needs: calcium, vitamins A, D and B12, protein, potassium, riboflavin, niacin and phosphorus. So what’ll it be – a chalky multivitamin or a smooth, delicious glass of milk? Delicious chocolate and strawberry milks are preferred by kids and deliver the same essential nutrients as regular milk! For growing children and active adults, Galliker’s flavored milks are a tasty and nutritional choice.